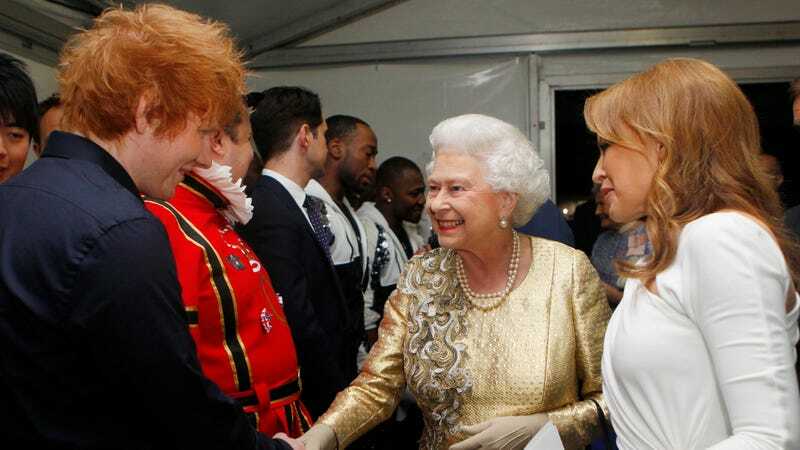 Kylie Minogue introduces Queen Elizabeth II to Ed Sheeran backstage after the 2012 Diamond Jubilee. Photo: Getty. As he picked up his honour, Ed said he would be happy to play the first song at Prince Harry and Meghan Markle’s wedding reception. After receiving his gong, the Yorkshire-born singer-songwriter revealed he’d not been asked by the Prince and his fiancee, but that he’d be more than happy to perform on their big day in May. While Sheeran and Harry aren’t exactly pals, the 26-year-old singer says he’d probably perform at Harry’s nuptials to Markle “if I was free” — but doesn’t want to get fans’ hopes up! “I feel like all Americans ask English people like, ‘Hey, do you know the queen?’ And like, well I have met her, that is quite a true fact, but I don’t know Harry that well,” he shared. Very modest. But eagle-eyed Jezebel readers will note that our very own Rich Juzwiak just predicted that his recent release, a version of “Perfect” with no less a guest star than Beyoncé herself, “is a diabolical scheme of a song clearly intended to ensure Sheeran is played multiple times at every white people wedding until the earth warms over and we all die of thirst.” A brilliant step in such a campaign would be getting his song into the royal wedding and therefore subject to what is already being deemed “the Meghan Markle effect.” Sounds like everything is going according to plan! What Are You Doing With That Guy, Beyoncé?